Thanks again to everyone who came out and helped with the Keolu Park Cleanup! The walls are nice and clean and the slippery graffiti has been removed from the transition! All the trash was picked up as well, but thanks to the skate community there wasn't much trash to begin with! Thanks to Richer Poorer, World's Best Graffiti Removal System, and Honolulu Parks & Rec for all the donations and support! 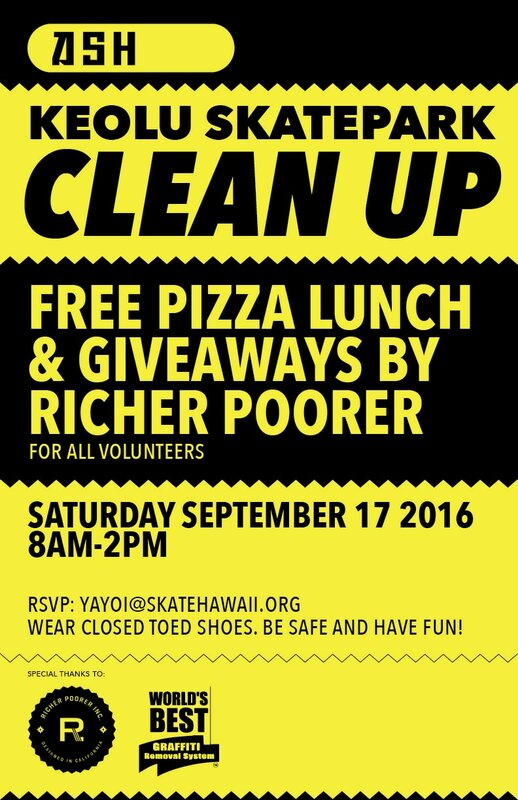 Attention volunteers, we are cleaning up Keolu Skate Park. We will be removing the graffiti from the transitions, picking up trash and repairing cracks. FREE PIZZA Lunch & Giveaways by Richer Poorer for all volunteers.